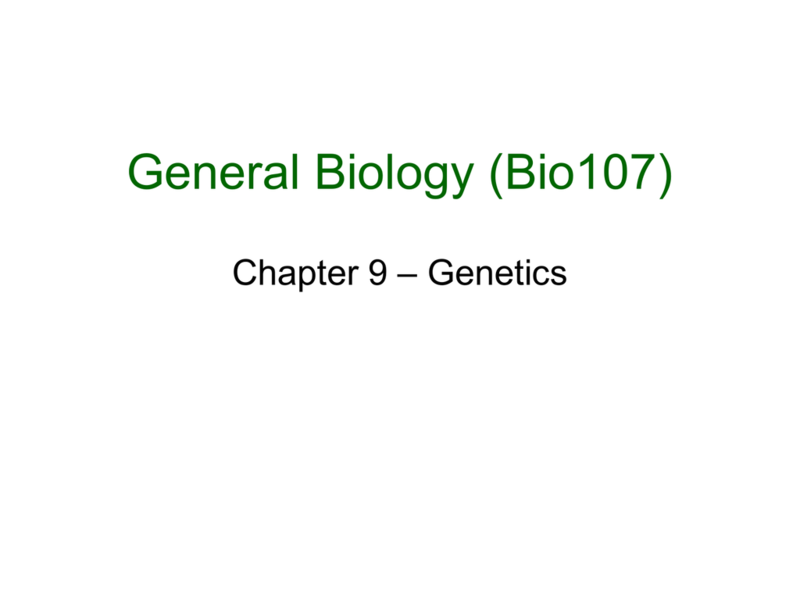 • Genetics is the scientific study of heredity or inheritance. 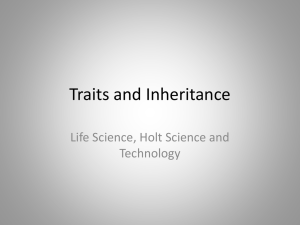 • These traits are transmitted from parents to offspring. should give rise to a uniform population of individuals. - Others show the natural variation within the "normal" version of the same species. of breeding experiments contradict its predictions.  e.g. blossom color, seed shape, pod color, etc. offspring are the F1 generation. 2. The law of independent assortment. white flower is a recessive trait. purple-flower factor in F1 hybrids. results that consisted of four related ideas. account for variations in inherited characters. nucleotides at the specific locus of a gene. alleles, one from each parent. chromosomes and therefore two copies of each locus. • These homologous loci may be identical, as in the truebreeding plants of the P generation. “A”), is fully expressed in the organism’s appearance. effect on the organism’s appearance. then that allele exists as a single copy in all gametes. receive one allele and 50% will receive the other. he observed in the F2 generation. 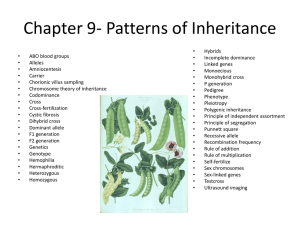 of gametes, 50% with the purpleflower allele and 50% with whiteflower allele. • Genetics has some unique, useful vocabulary. • A description of an organism’s traits is its phenotype. combination”) is referred to as its genotype. dominant and the other is heterozygous. identity of the unknown allele. yR, and yr) in equal amounts. phenotypes in the F2 generation. Each character appeared to be inherited independently. 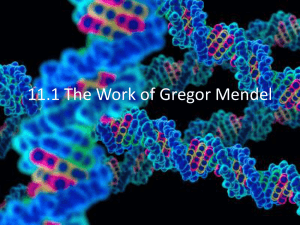 formation is now called Mendel’s law of independent assortment. 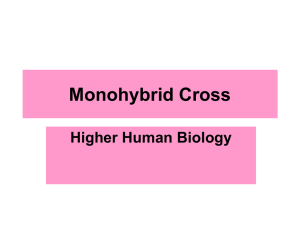 a 3:1 F2 ratio for each, just as if this were a monohybrid cross. by meiosis and reproduce by fertilization. 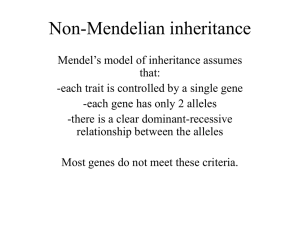 humans follows the same Mendelian principles of inheritance. simple dominant-recessive inheritance at one gene locus. • The most common lethal genetic disease in the US. Cl- between cells and the environment. of certain cells to become thicker and stickier than normal. • Without treatment, affected children die before year five. ethnic groups. One in 25 whites is a carrier of CF. due to a mutation in the gene coding for this enzyme. phenypyruvate accumulate in the blood to toxic levels. This leads to serious mental retardation of the affected new born. serious damage to many tissues in the body. African Americans is a heterozygote carrier of the sickle cell allele. It is a very rare disease amongst other ethnic groups. melanin in their skin, hairs and eyes. sunburned and have a high risk of developing forms of skin cancer. if close relatives marry and have children (consanguinity). periods of times (e.g. on an island, in a hard-to-reach valley, etc.). within the African American population. affected by malaria-causing Plasmodium strains. • Individuals are born with extra fingers or toes. • 399 individuals out of 400 have five digits per appendage. degenerative disease of the nervous system. 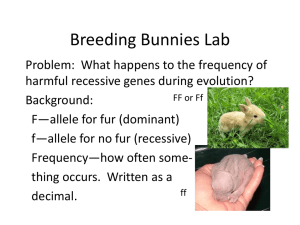 allele will not be passed on to future generations. is both a boon and a bane. • The genetic component is typically polygenic. environmental factors and healthy behavior. to assess the presence of a specific disease. karyotyped to identify some disorders. the eighth to tenth week of pregnancy. chrionic villi of the placenta. • This disorder occurs in one in 10,000 to 15,000 births. • This leads to mental retardation. phenyalalanine usually promotes normal development. 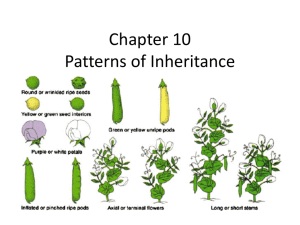 inheritance more complex than Mendel described. • Each character (but one) is controlled by a single gene. inheritance of the petal color of snapdragons. generational plants and in further crosses. 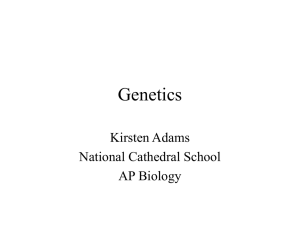 • Most genes have more than two alleles in a population. determined by three alleles, IA, IB, and I. • The IA and IB alleles are codominant to each other. possible genotypes and four possible blood types. 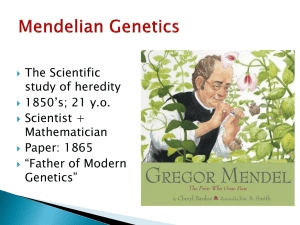 in a classical Mendelian pattern. 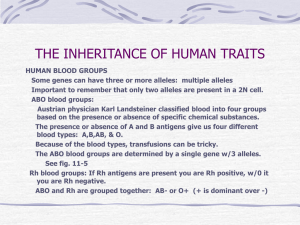 Classical example is the inheritance of blood types in humans. “H” enzyme  all humans have it! affecting more than one phenotypic character. disease are due to a single gene. that a gene can affect a number of an organism’s characteristics. effects of two or more genes on a single phenotypic character. dark, that demonstrate incomplete dominance. • An AABBCC individual is dark and aabbcc is light. the additive effects of two or more genes on a single phenotype. greenness, depending on exposure to wind and sun. improves performance on intelligence tests. differences as a result of their unique experiences. characteristics is a very old and hotly contested debate. gender; the generic embryonic gonads are modified into testes. the white-eye locus in Drosophila. that red eyes are dominant, Xlinked, while white eyes are Xlinked, recessive inherited. Certain traits and disorders in humans are inherited X-linked. their mother and will be phenotypically normal (no bleeders). one X chromosome is active. copy ) of genes on the X chromosome. which inactivates most of its genes. in ovarian cells that produce ova. skin patches lacking sweat glands. chromosome; both gene versions were linked genes.